Johns studio/workshop is just across the courtyard from their apartment in a converted Georgian country house near Taunton. John was born in Northampton in 1945. After leaving school he trained as an engineering draughtsman, but also attended Northampton Art College and found time to paint whenever possible, he exhibited locally including the Abington Park, Summer open exhibition. John has travelled extensively, throughout Europe and the Middle East. He has had several career changes, but for many years he has worked for himself, as an upholsterer, specialising in the restoration of antique chairs and sofas. 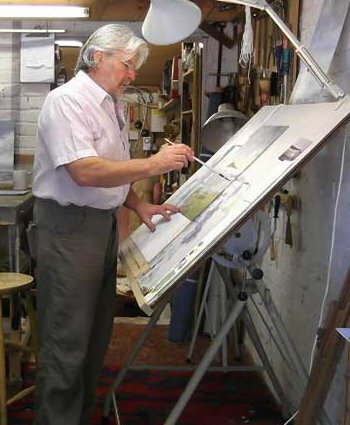 During this time it had been at the back of his mind to get back to painting and in 2012, with a nudge from Beverley, he picked up his brushes again. Although still working as an upholsterer/restorer for part of the week, he now has a dedicated studio. John has always been moved by the beauty of natures land and seascapes, he has a particular fascination with skies, especially in the way the sky interacts with water, Hence his favourite subject to paint, seascapes.